With commercial filming, one of the first considerations with any concept is whether to film on location or in a studio. Of course, some concepts naturally require location filming, like cars driving through a city or in the country, for instance. Other concepts are more open-ended, like one set in a store or a living room. With lower budget commercials (i.e. not national commercials), a company will usually choose to film in their own store to save money. Likewise, finding a living room of someone’s house to film is much more cost-effective than building a living room set in a studio. There are advantages to filming in studios, though, and sometimes it makes the most sense overall. The primary reason large production companies often choose to film in a studio versus on location is because of the greater control they have over every element of the production. Soundstages not only have standing permits, which means no special permit requirements, but they also have control over the sound in general of the area. Filming in a house somewhere requires permits from the city for street parking of numerous production vehicles, it has the potential to be interrupted by neighbors’ noise (barking dogs, car alarms, etc. ), and it provides a more constricted environment for lighting. With a studio living room set, walls can be moved to accommodate camera placement, lighting can hang overhead, ample electricity is always present even for the most intense lighting, and the vision of the creatives can be realized perfectly. If they want a living room that looks like a 1950s home, they can create it from scratch with the help of a skilled production designer. If they’re searching for a home with a 1950s style living room, they may get “close enough” but never exactly what they wanted. 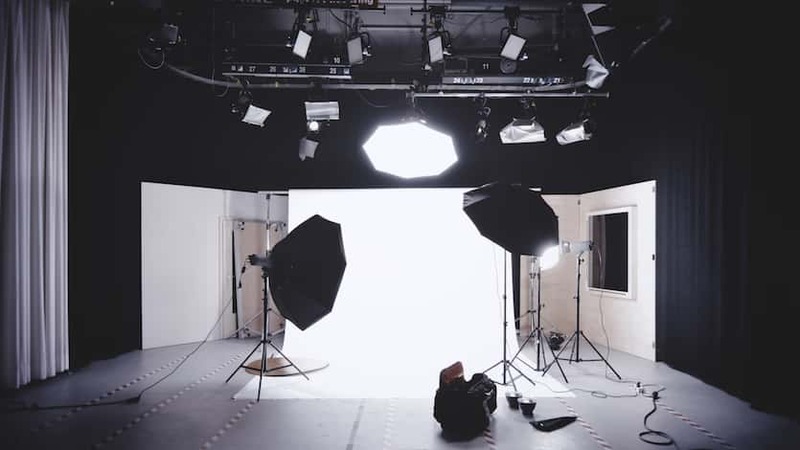 Filming in a studio can also make sense when filming on location would be prohibitively expensive, such as situations where a green screen has to be used for effects work, or specialty situations like filming in an aquatic soundstage rather than on the ocean. In other situations, nothing beats location filming, like a truly unique location that cannot be duplicated for a reasonable cost on a soundstage. Examples include a beautiful natural vista, a one-of-a-kind custom home, or skiing on a mountain. For smaller companies, the decision-making process is usually a financial one: which option is least expensive? For larger companies, the budget is high and the production company makes their decisions based mostly on creative and brand concerns. They know they’re going to have better control over a storefront if it’s recreated on a soundstage than if they have to film at an actual store with immovable walls and awkward fluorescent lighting. Though location filming has its challenges, it also has an authenticity that isn’t always recreated perfectly on set even with the best paid talent. The key is to control as much of a location as possible, which involves careful preparation. Before a film shoot, a production company usually arranges something called a “tech scout” where key department heads convene to survey the location and discuss potential challenges and obstacles in advance of production. For instance, the sound guy may notice an ambient hum of the HVAC system and want to make sure it can be turned off during takes. The cinematographer notices one of the planned filming rooms is smaller than expected so he wants to film the opposite direction with the camera in the door frame. Grip and electric notices because of the small room and limited power availability, they’ll need to light with mostly LEDs and low wattage lights that don’t occupy much space. When filming on location, even for smaller commercials, always be sure the production company has time to visit the locations in advance of the shoot. Dealing with problems on the day of production is a lot more challenging than thinking them through in a lower stress tech scout. Most location dilemmas have solutions, but only with proper planning and equipment. Also keep in mind that with multiple locations come “company moves,” where the entire production has to pick up and move to another location, which eats time. Typically, company moves are a bad idea for the middle of a day because of the lost productivity, but sometimes they are necessary. If so, make sure locations are not far from each other so that you don’t run out of time during the shoot day.